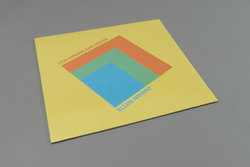 Ellen Arkbro - For organ and brass. Vinyl LP. Bleep. Young Swedish composer Ellen Arkbro releases a new collection of compositions through Subtext (FIS, Emptyset). A student of LaMonte Young and Marian Zazeela, Arkbro’s focus on microtones and ghost notes allows her to create slow-moving pieces of great power on For Organ And Brass. The twenty-minute title track is a monolithic thing built on the droning majesty of a Renaissance organ. Elsewhere ‘Mountain Of Air’ and ‘Three’ are stately processions that recall Arthur Russell’s Tower of Meaning and These New Puritans’ Field Of Reeds.